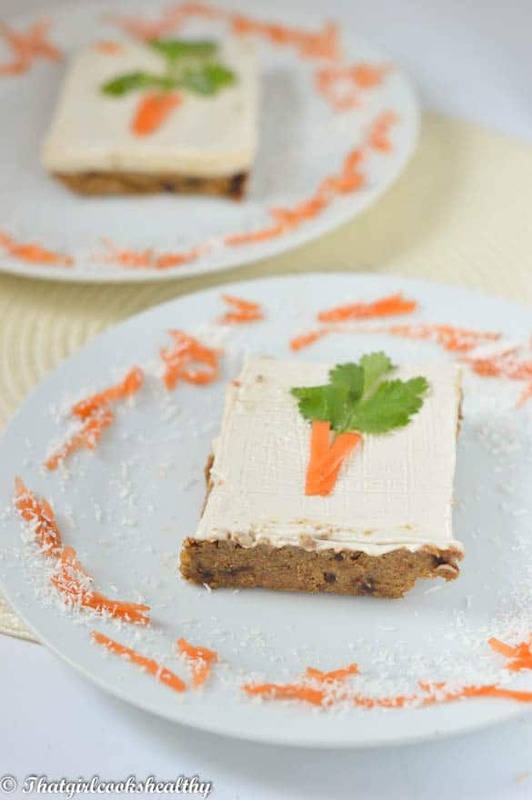 Raw carrot cake – this cute little carrot cake is a raw version of the infamous cake made with coconut, dates, carrots and sunflower seeds. Carrot cake is just one of those all time classic desserts that almost everyone seems to enjoy. It’s like that naughtly guitly treat. However, would you believe me if I told you that you could make your very own raw version of this delectable cake, using a handful of ingredients? 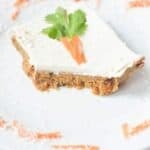 Have your raw carrot cake and eat it!! 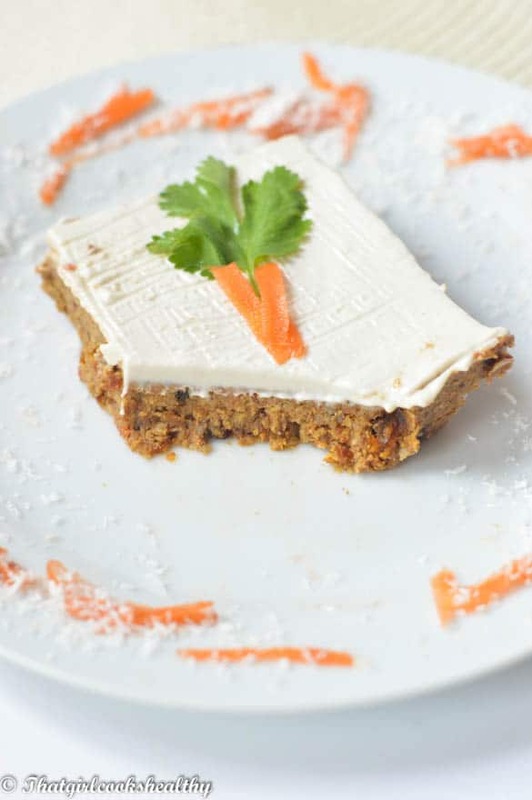 Well if you’re really serious about upping your health game and going the raw route then you definitely don’t want to miss raw carrot cake recipe. 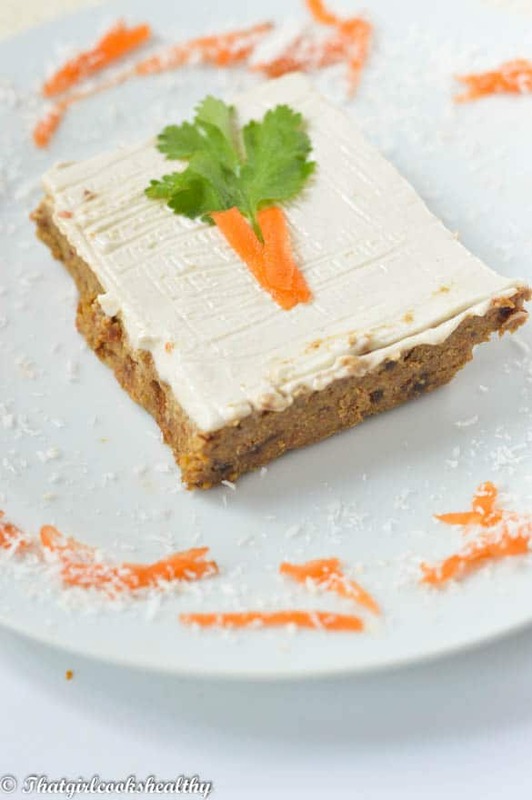 As mentioned before, carrot cake is the quintessential baked treat, it’s the type of cake that many people miss when conforming to a specific dietary requirement, in this case being raw. You don’t have to be a fully fledged raw lifestyle type of person to enjoy this cake. I’m not a raw eater but I enjoy raw treat like chocolate protein balls from time to time – they taste amazing!! All you have to do is simply be open minded to trying something new and different. If you’re a fan of raw treats then you’ve probably beat me to it with this raw rendition of a modern day classic – made with sunflower seeds – another type of healthy omega fat and a source of protein. The topping is an epic cashew cream icing. Food processor is needed – The prep isn’t too cumbersome, the food processor will do most of the work. Just start by grating the carrots, shouldn’t take too long, a few minutes maximum. Move onto adding the coconut, vanilla, carrots, dates, sunflower and spices into the food processor to pulse and form into a pliable dough. Soak the dates – The dates need to be pre-soaked, drained thoroughly and blotted off. Soak for 30 minutes to an hour in lukewarm water. The carrots hold their moisture, so moisture from both the dates and carrots will create a stick dough (hence why I said to drain and blot the dates). Line a brownie tin with parchment paper – You’ll need a square brownie tin lined with parchment paper to house the base and allow it to freeze for 1 hour. Prepare the cashew topping – In the meantime make the topping ready for the base. There’s a choice with setting the topping in the refrigerator which creates a soft yet firm topping or freeze for another hour to form a solid top. 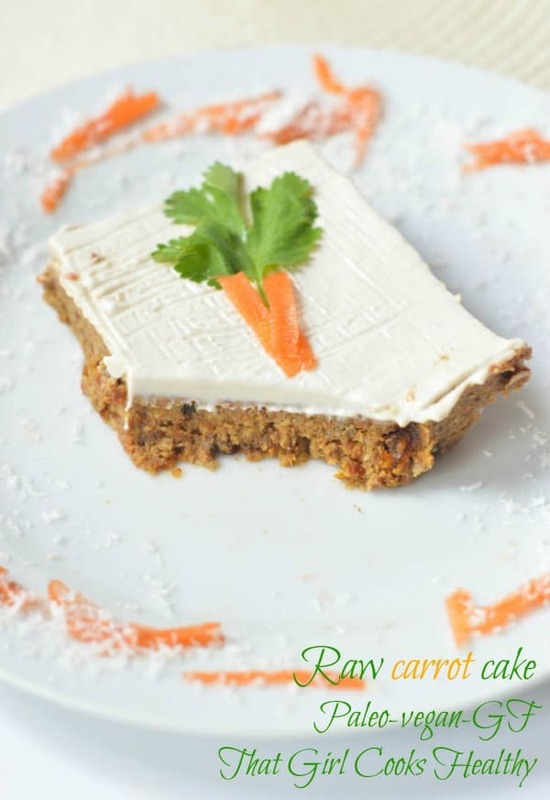 How you tried raw carrot cake before? Do you prefer eating a baked carrot cake? 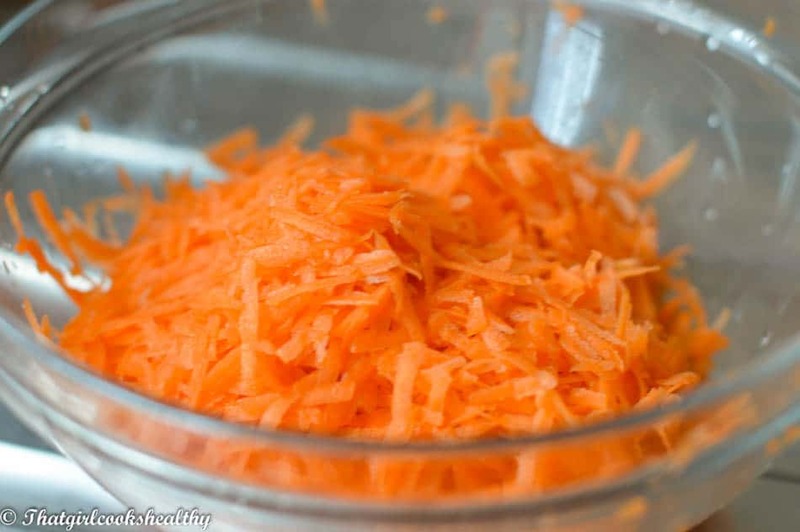 Grate the two carrots using a grater box in a large bowl and set aside. 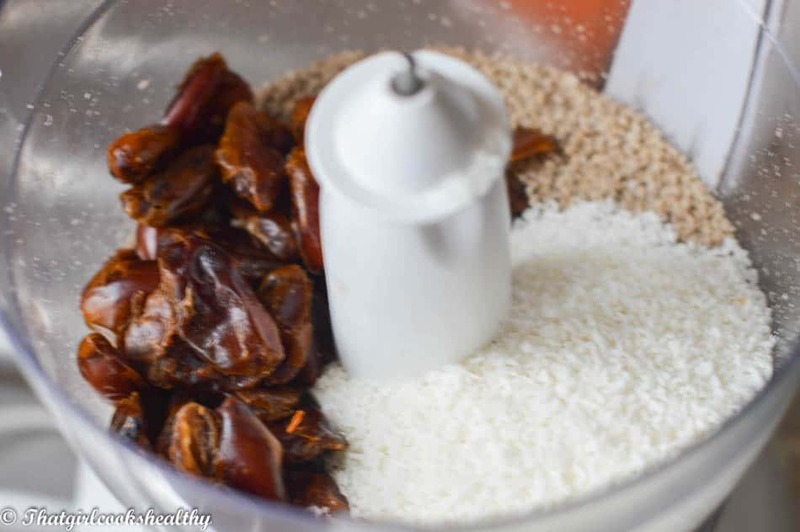 Using a food processor with an S blade, pulse the sunflower seeds into a fine meal and add a few of the pre-soaked dates at a time to the processor. While the machine is still running add the rest of the outstanding ingredients and continue until a pliable dough is formed. Line a square brownie tin with parchment paper and pour the dough onto the tin, spreading it out evenly – cover with some foil or cling film and freeze for an hour. In the meantime add the ingredients for the creamy icing to a blender to create the topping. It should be creamy not running, so add the water in increments and use accordingly. Layer the top with icing and put in the freezer for another hour. If using the refrigerator method store until firm and serve. Option to either freeze or refrigerate to set the icing. Store the leftovers in the freezer for longevity. These are too cute Charlene, I love your little carrot decoration on them as well! I have all these ingredients in the pantry, I’ll be making these this coming weekend! Is that really all you use for the icing? It seems very white for just ground cashews and a bit of coconut nectar (I assume I can sub any kind of natural sweetener for the coconut nectar, like rice malt syrup?). Wow! I have yet to try a carrot cake . If it looks this good then my not- especially with coconut . Count me in. Thanks Imma, I hope you get the chance to sample some soon. Tried this and it was great! I did find that the icing quantities gave a fair amount of left-over; I would estimate that 1c of cashews instead of 1.5c would have been close to perfect for the pan size that I used, so next time I might 2/3 the recipe for the icing. Other than that, it was ace! Thanks Charlene! Thanks for the feedback Jolie, glad you liked it!